[163 Pages Report] The cranes market was valued at USD 31.58 Billion in 2016 and is expected to reach USD 44.70 Billion by 2023, at a CAGR of 5.22% between 2017 and 2023. 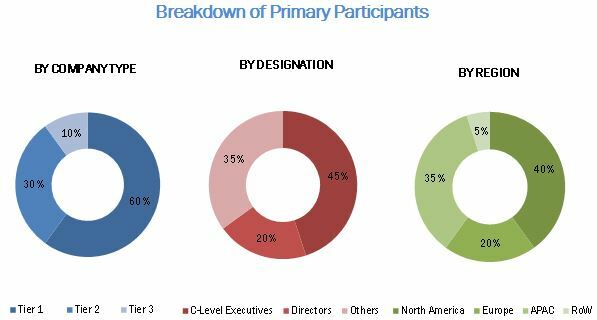 The hoists market was valued at USD 1.73 Billion in 2016 and is expected to reach USD 2.65 Billion by 2023, at a CAGR of 6.41% between 2017 and 2023. The base year considered for the study is 2016, and the forecast period is between 2017 and 2023. The growth in new and retrofit infrastructure after the recession has boosted the construction industry heavily. With new development plans and projects, the use of construction equipment is also growing. In the construction industry, cranes are widely used owing to their strength, performance, and reliability. Along with tower cranes, crawler and truck-mounted cranes also play a major role in lifting and lowering of construction material in construction sites. Crawler, rough-terrain, and all-terrain cranes are also used in construction sites for lifting prefabricated steel structures for different kinds of residential and nonresidential buildings. The mining industry has led the hoist market with a substantial growth rate and is expected to drive the hoists market growth during the projected years. Mine hoists are responsible for conveying, maneuvering, and transporting ore materials through mine shaft and among machinery parts. A mine hoist comes in various shapes and sizes. Commonly, a single machine is deployed to operate several mine hoists. 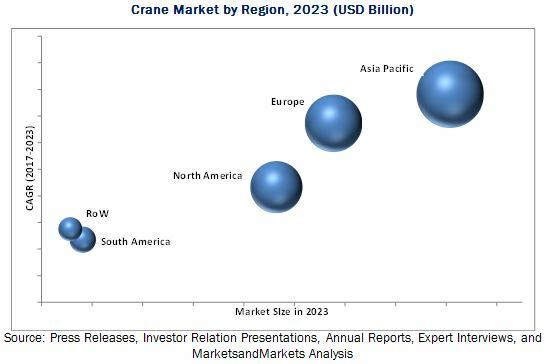 The objective of the report is to provide a detailed analysis of the crane and hoist market based on type, operations, industry, and geography. The report provides detailed information regarding the major factors influencing the growth of the crane and hoist market. The report also gives a detailed overview of the value chain in the crane and hoist market and analyzes the market trends. This research report categorizes the overall cranes market on the basis of function, specification, application, bore size, industry, and geography. The cranes market is expected to be valued at USD 32.93 Billion in 2017 and is projected to reach USD 44.70 Billion by 2023, at a CAGR of 5.22% between 2017 and 2023. 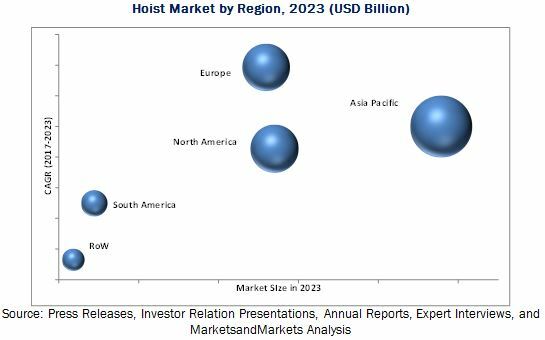 The hoists market is expected to be valued at 1.82 USD Billion in 2017 and is projected to reach USD 2.65 Billion by 2023, at a CAGR of 6.41% between 2017 and 2023. The growth of the crane and hoist market is propelled by the increasing demand for construction machinery in the construction industry and in the mining industry for ore extraction. The increasing demand for lifting loads in the shipping industry and for material handling equipment in the aerospace & defense industry is a key opportunity for the players in the crane and hoist market. The crane and hoist market has been segmented on the basis of type, operations, industry, and geography. The cranes market for hydraulic cranes by operations held the largest market share in 2016. Hydraulic cranes are widely used for hoisting and moving heavy materials in shipyards, warehouses, and industrial workshops. Moreover, hydraulic cranes are used in transport, manufacturing, and construction industries. The retraction length of hydraulic cylinders is 20–40% of the fully extended length. The cranes market in Asia Pacific held the largest market share in 2016. Asia Pacific being the most rapidly growing market offers a huge opportunity for agricultural equipment manufacturers owing to the enormous development in the farm machinery segment. This is driven by the increased demand for the mechanization of farms to address the needs of the growing population. Several governments provide support to increase the productivity in the agriculture sector through the automation of farming methods. India and China are the major markets for cranes in Asia Pacific. Moreover, the rapid development of industries such as construction, agriculture, infrastructure, and mining drives the market for cranes in India and Australia. The market for wire rope hoists held the largest market share in 2016. Wire rope medium changes according to the load capacity of the hoists, and these hoists are powered electrically or pneumatically, and are mounted overhead on the bridge beam with the help of a trolley. Wire ropes are widely used in the production environment because they offer fast lifting time. They are normally used to lift objects weighing below 10 tons. In the hoists market, Asia Pacific held the largest market share in 2016. The need for increasing the production output without compromising on quality standards has affected the manufacturing sector in China. Manufacturers and suppliers are facing challenges in terms of the increasing labor cost and higher lead time caused by manual processes. Hence, companies are automating their processes, thereby driving the hoists market in China. The major restraint for the crane and hoist market is the lack of skilled manpower to operate crane and hoist. The demand for skilled technicians has been on the rise for years. However, most industries face a shortage of qualified engineers and maintenance staff to properly support and maintain equipment. The use of a large number of components in a crane necessitates the requirement for highly skilled labors to mount components and harness cables and operate different crane and hoist to lift and lower different weights. Top companies such as Konecranes (Finland), Cargotec (Finland), Terex (US), Tadano (Japan), Liebherr (Switzerland), Manitowoc (US), Ingersoll Rand (Ireland), Mammoet (Netherlands), ZPMC (China), Kito (Japan), XCMG (China), Zoomlion (China), and Columbus McKinnon (US) are adopting the strategy of product launches for improving their position in the crane and hoist market by either expanding their existing portfolio or adding new offerings. In January 2017, Columbus McKinnon has acquired STAHL Crane Systems (Germany), a manufacturer of explosion-protected hoists and crane components. This acquisition allows the company to focus on its growth in non-US markets and to expand its market in Europe. Columbus McKinnon has also acquired Magnetek (US), a leading designer and manufacturer of digital power and motion control solutions for material handling, elevator, and mining applications. Liebherr has adopted the organic growth strategy to grow in the industrial lifting equipment market. The company launched several new products between FY2015 and FY 2016. The company focuses on innovation and new technologies; the company has invested USD 600.5 Million, 6.33% of its total revenue in R&D. In 2005, Liebherr has acquired the Shriro tower crane division from the Shriro group in Hong Kong. With this acquisition, Liebherr-Singapore became responsible for the Liebherr tower crane business throughout Asia.